Tumbling in the waves as they hit a rocky shore tells purple sea urchin larvae it’s time to settle down and look for a spot to grow into an adult, researchers at the University of California, Davis, Bodega Marine Laboratory have found. The work is published April 8 in the journal Proceedings of the National Academy of Sciences. Like most shoreline animals, purple sea urchins (Strongylocentrotus purpuratus) have a two-stage life cycle. The young are microscopic, look completely different from adults and drift in the upper levels of the ocean for about a month before settling on a rocky shore and transforming into the familiar spiny adult. “Once they decide to settle, they attach to a rock and undergo body remodeling into a juvenile sea urchin with spines,” Gaylord said. Over short distances, the larvae can respond to chemical traces in the water, especially substances that might be given off from a rock thick with algae or other food for the growing urchins. But how do the larvae know they are close enough to the right shoreline habitat to start searching for such signals? On the California coast, rocky headlands — the urchins’ preferred environment — are interspersed with long stretches of beach that experience lower levels of turbulence. The larvae don’t have the resources to swim for miles along a beach looking for a nice slimy rock, but when carried by currents near a wave-swept rocky reef, the high turbulence tells them to begin a finer-scale search, the researchers found. Gaylord and co-authors Jason Hodin of Stanford University’s Hopkins Marine Station and Matthew Ferner of San Francisco State University used a device called a Taylor-Couette cell to see how urchin larvae responded to being churned by shear forces comparable to those in waves breaking on a rocky shore. The Taylor-Couette cell consists of one rotating cylinder inside another, with a layer of fluid in between. When the cylinders spin relative to each other, they set up shear forces in the fluid. Scientists more typically use the device for studying fluid dynamics, especially the transition where flows becomes chaotic and turbulence appears. Gaylord and his colleagues took the urchin larvae for a spin through a Taylor-Couette cell then exposed them to potassium, known to act as a chemical signal that triggers larvae to begin settling. Larvae that had been exposed to turbulence responded to the chemical signal earlier in development than those that had not — in fact, they responded at a stage at which it had previously been believed larvae could not settle. Especially telling was that neither turbulence nor the chemical signal alone promoted settling at this earlier developmental stage. The experiment shows that the shift from living free in the ocean to living on a rock is a two-step process, Gaylord said. 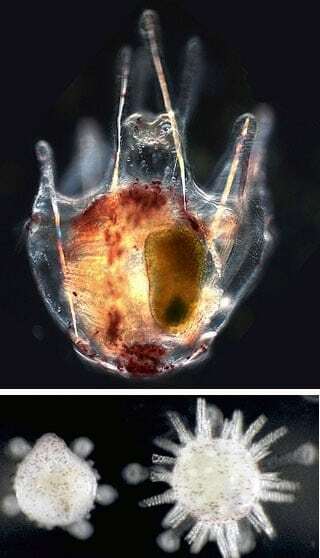 In the first step, exposure to turbulence initiates an abrupt transition to a state in which the larvae are “competent to settle.” A chemical signal triggers the second step, actual settlement, and the larvae then complete their transformation into juvenile sea urchins. It’s not yet clear how the larvae detect turbulence, Gaylord said. That might happen through receptors that respond to stretching or flexing. The two-step settlement process might occur in other species that settle on shorelines, he said. The work was supported by the National Science Foundation and the National Oceanic and Atmospheric Administration.